I would be lying if I said that I love these sculptures. They actually creep me out a bit. They have a Cabbage Patch Doll with Proteus syndrome quality that’s, well, for lack of a better word, disturbing. Nevertheless, I find Dutch artist Rosa Verloop’s nylon soft sculptures fascinating, as well as a great way to recycle ripped stockings. 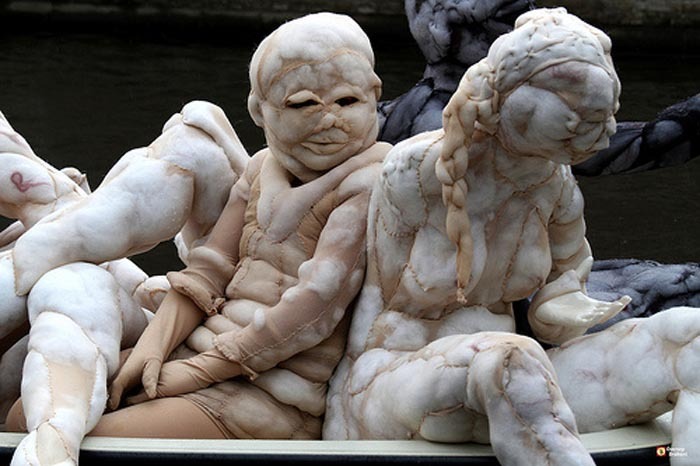 The third photo down on the right is the artist herself wearing one of her pieces as a costume at the Boschparade 2010 (in The Netherlands), and the one below that, which looks like a deformed skull (or Frankenstein-ish monster) with a built-in camera is just great. Photos: courtesy of the artist, except for second from top by Ed Jansen at Zomer Expo 2012. Interesting, but definitely a bit creepy.